Over the time, these engines have proved to be cheap and reliable. People due to its compatibility particularly have favored the model number 3208. This model is suited to all boat structure. The original engine did not have any cylinder liners. The 1981 version of the Caterpillar marine engine saw a change in design. Three ringed pistons along with stronger water and oil pumps was a major upgrade. A bigger seawater pump and heat exchanger were incorporated to exhaust manifolds and help in cooling of the engine oil. 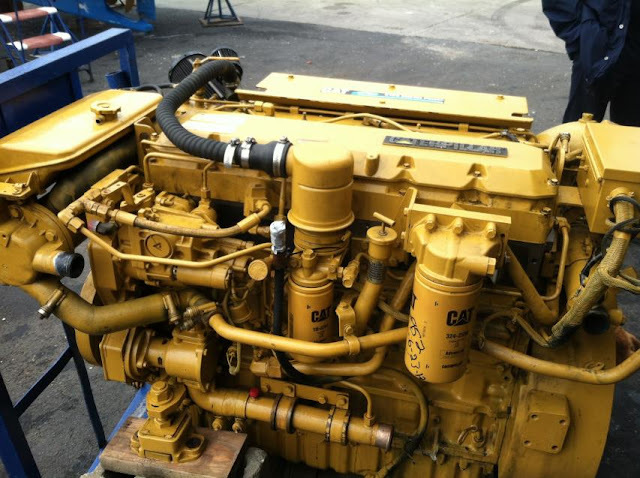 These caterpillar marine engines found it use in many things. Despite that, it widely gained popularity with the pleasure boats and yacht sections. Recently it all found it use in USA‘s marine systems. The engines are strong and sturdy due to traditional iron used. These use the most up-to-date technology, thus being a reliable power source. The simplicity and the cost effectiveness make it a dominant feat in the world market. The CAT engines are environment-friendly engines. While construction, it is made to pass through all the accurate emission tests. It is build thinking about the future, where it can deal with even more emissions than the present times. The fuel efficiency of these engines is another factor that makes it widely popular. The inculcation of a leading fuel system reduces the total quantity of the fuel used. Compared to other engines in the running or those that have been previously made in the past, CAT engines emit far lesser emissions. The Caterpillar Marine engines haveelectronically controlled fuel injector structure. This system increases combustion at different speed and stacking levels.CAT engines have a broad operating range of speed. These engines have a wide range. It also has a unified marine power display for the easy monitoring of the engine and fast responsiveness.